The Riverwalk in Chicago is the perfect location for visitors to enjoy the views of Chicago's Loop district with its towering skyscrapers, magnificent structures, and architectural designs. 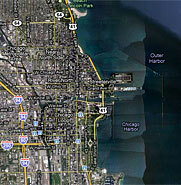 It encompasses the shoreline of the Chicago River running from Lake Shore Drive all the way to Franklin Street. The Chicago Riverwalk is a public walkway with free admission and is open daily. With comfort in mind while taking a leisurely stroll on the walkway, seating is available along the Chicago Riverwalk, giving visitors the opportunity to rest, relax, and enjoy the sights and sounds of the riverwalk from one end to the other. While enjoying the promenade, visitors have access to museums, monuments and the Riverwalk Gateway along the way. At the Wabash Plaza, visitors can stop at the Vietnam Veterans Memorial housed at the plaza. Also along the walkway are the five-story McCormick Tribune Bridgehouse and Chicago River Museum. The Bridgehouse museum is inside the southwest tower located on the bridge at Michigan Avenue and is accessible from the riverwalk. The museum provides historical information about the river and allows visitors to see the inner workings of the gears that raise and lower the bridge. The Riverwalk Gateway is a visual history lesson of the beginnings and accomplishments of the city and its connection to the river. It is currently the largest piece of public art on display in Chicago. Painted by Ellen Lanyon on 28 individual panels—twelve exquisite decorative panels and sixteen meticulously detailed narrative panels—the individual murals depict each stage of the city and the river's joint history. The murals of the Riverwalk Gateway take up 336 feet of wall space in a well-lit passageway beneath Lake Shore Drive. The passage allows visitors a clear and unhindered look at the panels regardless of weather conditions, and it links the Chicago Riverwalk to the path on the other side so visitors can continue their journey along the walkway. Cafes dot the way along the Riverwalk in Chicago with a variety of choices in food selections. In addition, bicycles are available for rent through Bike Chicago, and biking tours of the Riverwalk in Chicago area are available for those who want a more in-depth look at the city. Several companies also provide water taxis, narrated boat tours, and scheduled cruises for a closer look at the city and its skyline, waterways, and the downtown area. On Saturday and Sunday, hand-crafted arts and crafts, souvenirs, and gourmet baskets are available for sale on the Chicago Riverwalk. All of the items are created by local women in business and available through Women-Eye Inc. Most areas of the riverwalk are accessible to people with disabilities, though there are areas of the walkway along with cafes that are only accessible by using the stairs. Parking is available for people with disabilities at select locations nearby.